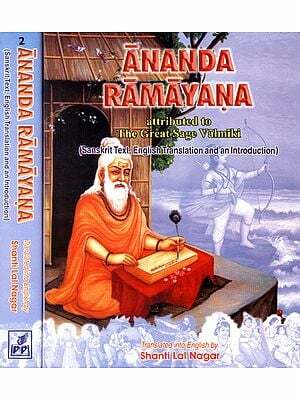 Valmiki Ramayana has been the wonder of Indian classical literature. It is one of the two epics. 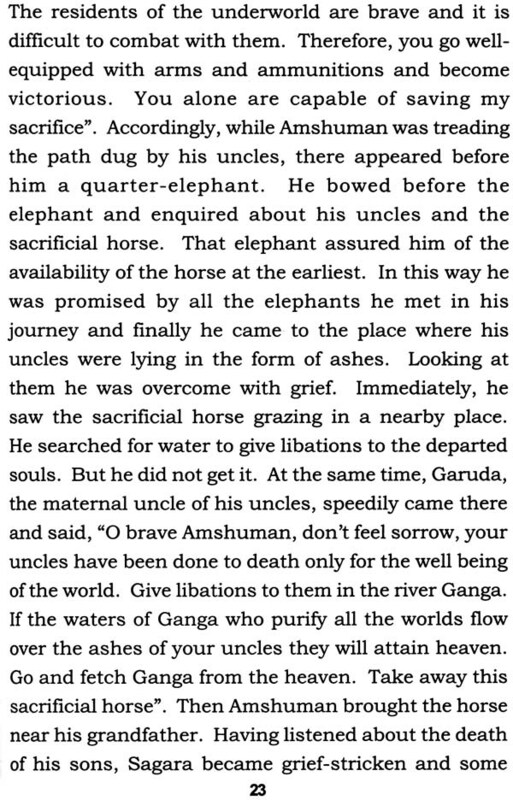 Mahabharata is the other epic. Prof. K.G. 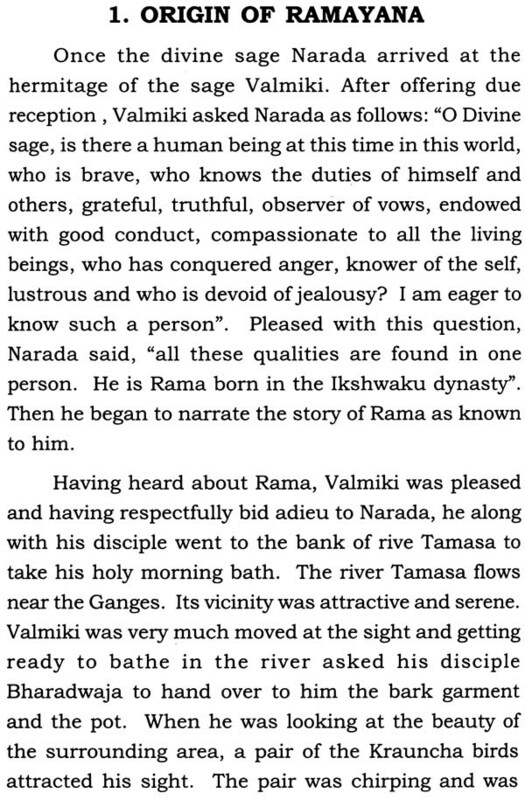 Krishnamurthy in this book “Stories in Valmiki Ramayana.” This book is the English version of the book written in Kannada in the year 2000 A.D. by the same author. Prof. K.G. Krishnamurthy hails from Shimoga in Karnataka. He studied Sanskrit as a major subject in B.A. He did his M.A. from Bombay University with distinction. He is a ‘Shastri’ of Bhartiya Vidya Bhavan, Bombay. He has passed M.A. in English from Karnatak University, Dharwar. Prof. K.G. Krishna murthy did M. Phil. from Bangalore University. He taught Sanskrit in colleges in Shimoga, Sagar and Bangalore. He served at the Rural College, Kanakapura for 35 years as Professor of Sanskrit. At the end of his service he worked in B.M.S. College for women, Bangalore. Prof. K.G. Krishnamurthy has authored many books: ‘Samskruta-bhashe mathu sahitya’ was the first book jointly written by him and his frind late Dr. B.S. Ramakrishna Rao. ‘Samskrita Sahityada Sanskshiptha Charithre’, Ramayanada Upakathegalu are his other works in Kannada. His translation of Katha saritsagara is published by Karnataka Anuvada Sahitya Akademy. He has edited two texts book for Sanskrit students of Bangalore University. A few years ago, I started to study Valmiki Ramayana with Kannada translation of Vidvan N. Ranganatha Sharma. 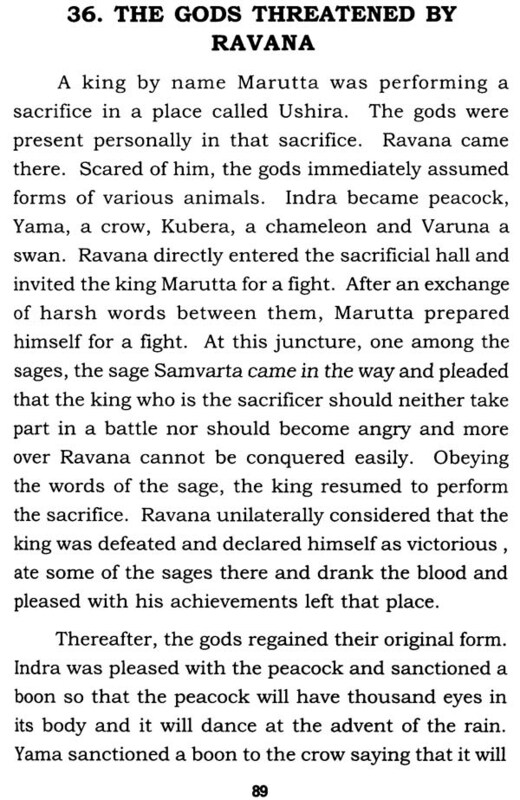 After reading the first sarga, which itself contains the story of Rama in about 100 shlokas, I eagerly began to note the contents of the succeeding sargas. 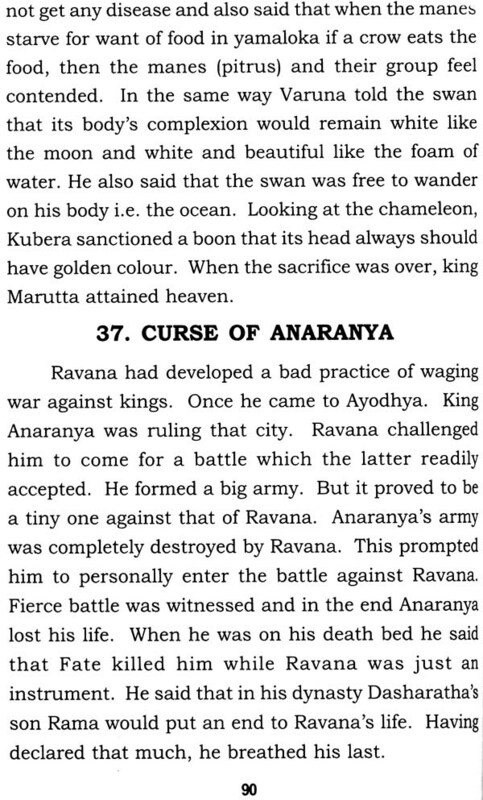 A story depicting the origin of Ramayana is narrated in the second sarga. Story of the sage Rishyashrunga, stories regarding the name given to Angadesha, Malada and Karusha, Tataka are told in those sargas. These stories tempted me to separate them from descriptions and write one after the other in simple Kannada so that story-loving readers, especially children, enjoy reading them. 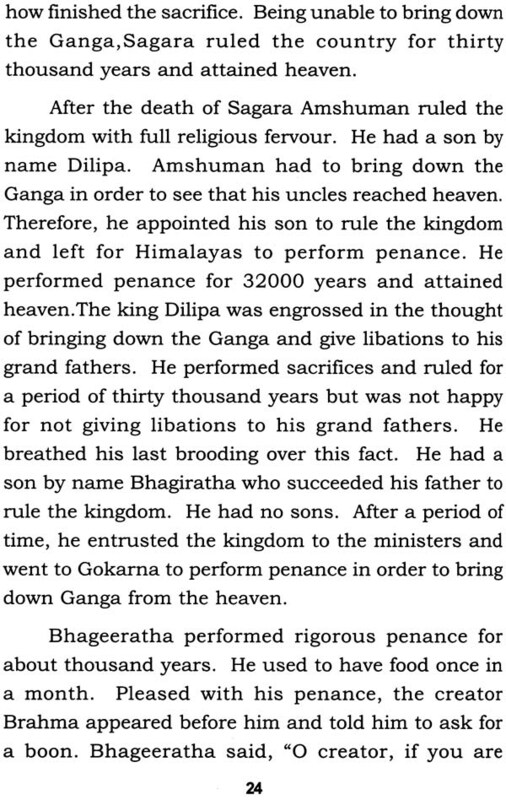 The Balakanda contains many such stories told by different people on different occasions. The main story of Rama supported by other stories makes the reader enjoy the epic Ramayana. 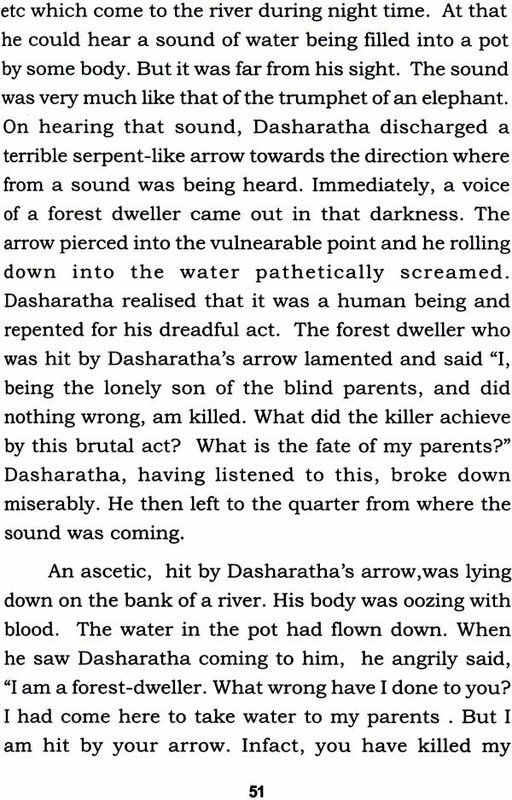 Even though other Kandas also have some stories, the Uttarakanda is packed with more such stories relating to Ravana, his forefathers, his brothers, and his son Indrajit. 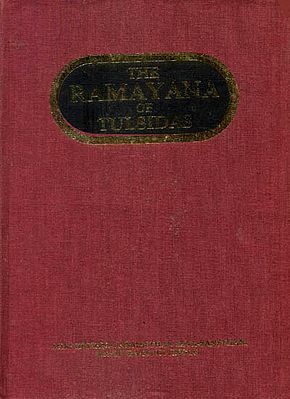 Many other stories, even though not related to the main theme of the Ramayana, have been narrated in it. Thus, we can enjoy reading stories one after the other. I collected about 50 stories and wrote in simple Kannada giving suitable titles to them. When I met my bosom-friend late Dr. B.S. Ramakrishna Rao and told him about my venture, he felt very happy and forced me to bring the stories in a book form. He himself went through the manuscript and read the proof of the print. Thus, "Ramayanada Upakathegalu" was published in the year 2000 A.D. and was well received by the book lovers. The copies were sold out within 2-3 years. Now, I am bringing out the second edition of the same work. I t was my desire to reach larger readers through the English version of the same book. I began translating into English a year ago. When I revealed the project to my teacher and men tor Prof. T.S. Krishnamurthy, he encouraged me to expedite the translation work. It is his pressure that made me to shun laziness and complete the translation work. He has, out of love and affection, gone through the manuscript and made suitable corrections. He extracted some stories from Ramayana and asked me to add to the book. The last eight stories in the book are written by him. His writing has enhanced the value of the book. I am grateful to my teacher and out of high regard for him, I humbly dedicate this book to him. I myself have done the DTP work and read the proof. Mistakes, if found, are mine. I sincerely thank MIS Prapti Prakashana for publishing this book. My thanks are due to MIS Vidya Bharati Press for neat printing. The literary heritage of India is one of the world's most outstanding miracles. Even excluding vast Vedic texts, works like the Ramayana, Mahabharata and Bhagavata would themselves rank among the greatest human achievements. If we were to look for the place where India deserves to be credited for distinct and uncommon originality, it is perhaps in the above three monumental works. These texts are not mere books, but may be termed as 'Indian universe'! 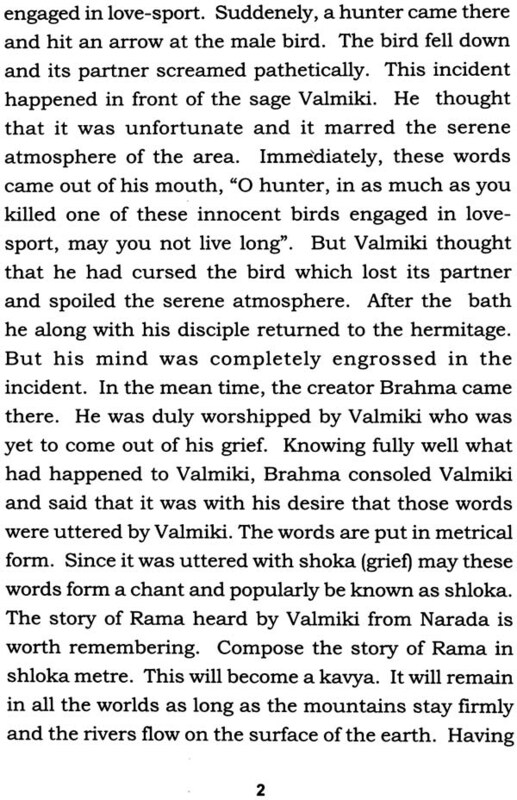 As a sage and a poet Valmiki stands one amongst the greatest figures in the literary history of the world. He has so stamped himself on his monumental work, the Ramayana, that it has remained the very paragon of Indian epics. 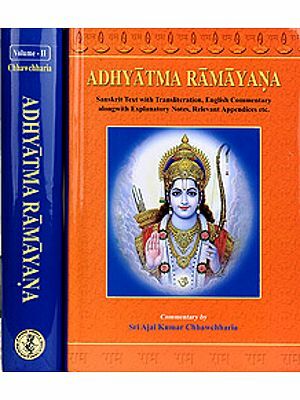 Apart from the main story, many beautiful and enchanting stories abound in the Ramayana also as in other two works. These stories have given solace and delight to the readers. Here is a collection of such stories selected from that immortal epic. These are of bewildering variety and have lessons for all, young and old, and so deserve to be read with interest. Prof. K.G. Krishnamurthy has done a magnificent job, for he knows where to dive to retrieve these gems and pearls of stories from the ocean of the great epic. This is no idle claim. In fact, he is an adept in that venture. The kannada version of these stories published in January 2000 has had an enthusiastic reception from the reading public. Prof. Krishna murthy has now brought this English version. In this version he has added a few more stories which are equally rewarding. He has written these stories in lucid and elegant English prose. Therefore, the book is eminently readable. 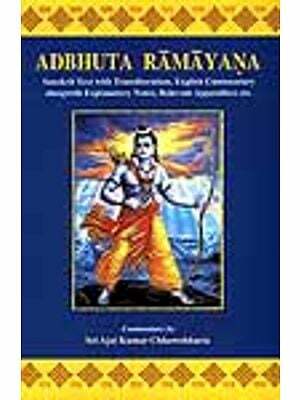 This foreword provides me an opportunity to acknowledge my appreciaton to the author for bringing out this useful collection of stories from that classic of an epic, the Ramayana. At the prsent moment, when there is a growing interest in the cultural heritage of the country, the publication of these stories in an enduring form, will, it is hoped, be welcomed by the reading public. 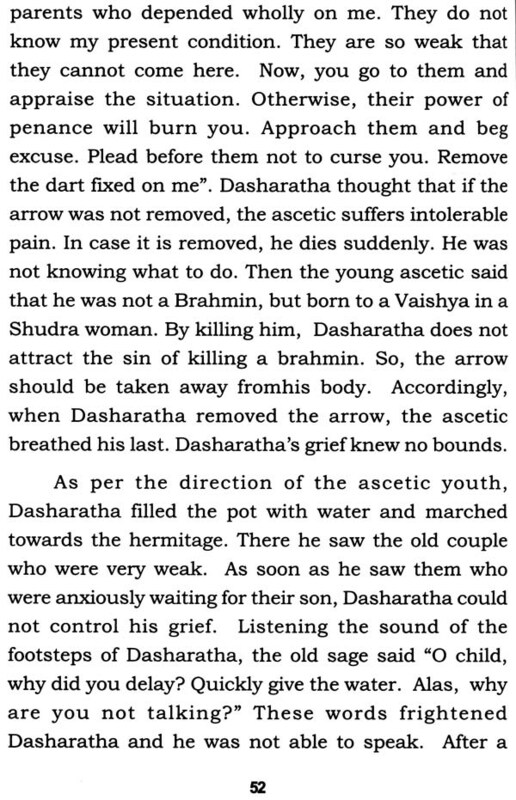 If he brings out a similar collection of stories from the sister epic, the Mahabharata also, that would provide a beautiful and strong second string to Prof. Krishnamurthy's literary lute.